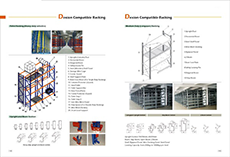 T Racking just ship one tender of super market shelving in Africa. These years Africa economy is keeping booming, especially for the rich resource countries like South Africa and Nigeria. South Africa and Nigeria have the largest population in Africa which is a good base for retail industry. The price of oil and diamond stands in high level which help Africa earn a lot of money. This customer is in Angola, which is a countries competitive in agriculture and oil industry. The customer get our information from exhibition. This customer is a big retail group in Africa. They build several super market in Angola several years ago, when business is keeping better, they would like to build several more supermarket. Customer send us a layout for a building which they want to build supermarket. After check the layout, we found it’s not 100% suitable for supermarket due to construction and building structure. Customer decide to build a complete new building for the supermarket. China these years also export a lot of steel structure building to oversea countries. Customer thus decide to import the entire supermarket building from China. They have a rough design for a new building from one company, then send the drawing to us to design supermarket shelving. After get the design, our engineer design the total supermarket in a few days then cooperate with the building company with the revise idea of customer. Also cooperate with other equipment supplier like refrigeration equipment and bakery equipment. A few days later, customer get the final cost of total warehouse and all the equipment. Customer is impressed by our high efficiency and competitive cost. Customer then place orders to different suppliers. After that we manufacture relative supermarket equipment in time and delivery them in several containers. 2 months later, customer got all equipment and finish the installation in the following month. As a leading shelving supplier, T Racking export thousands of Africa supermarket shelving and gondola shelving to all over the world. Contact with us today to get more detail!